German chancellor Angela Merkel is said to be up in arms about George Bush’s refusal to give ground on climate before the G8 Summit next month. Merkel has played down expectations of a breakthrough on climate change at next month’s G8 summit, admitting she “did not know” if a pact on greenhouse gas cuts would be reached. Germany, host of the summit at the coastal resort of Heiligendamm, is locked in tough negotiations with the US, which is refusing to endorse Ms Merkel’s call for targets to reduce carbon emissions. In her most detailed speech on Germany’s summit expectations, Ms Merkel told parliament “we must significantly and quickly reduce emissions of greenhouse gases to limit the earth warming”. Ms Merkel said that “common understanding” was essential in determining “what agreements can be made for the period beyond 2012”, when the Kyoto climate agreement expires. 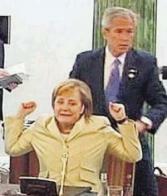 Common understanding between Merkel and Bush? I doubt it..